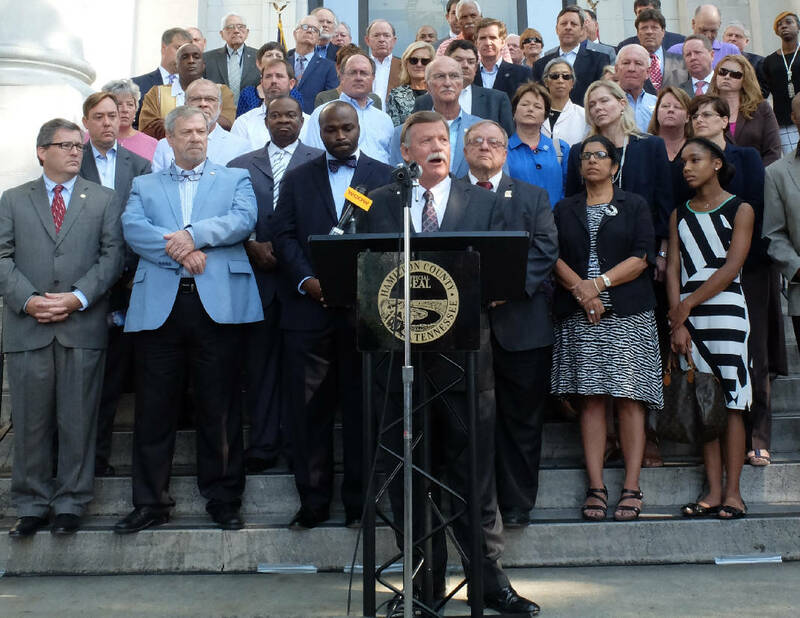 Hamilton County Mayor Jim Coppinger announces new projects for the county that will include a tax hike on the steps of the Hamilton County Courthouse on Tuesday, Aug. 29. Hamilton County Mayor Jim Coppinger is proposing to raise taxes for most county property owners for the first time in a decade to fund the biggest bond-borrowing program in the county's history to upgrade schools, sewers and jails. "I truly believe we are at the crossroads with education and economic development, and I think this is the right thing to do to keep this county moving ahead," said Coppinger, who announced his support Tuesday for the first property tax increase since becoming county mayor six years ago. "To me, tax increases should absolutely be the last resort, and if I didn't feel that we were at that point, I certainly wouldn't ask for this increase. But my fear is we're going miss a huge opportunity if we don't act now." Under a plan to be submitted to the Hamilton County Commission today, the county will keep the extra $25.5 million generated from the countywide property reappraisal this year, which raised the average value of existing homes and businesses by 9.7 percent. The higher property taxes will fund a $180 million general obligation bond issue for school buildings and a new jail and another $45 million revenue bond issue to build a new sewage treatment plant to open up more land for development in the eastern portion of the county. In June, the county commission approved a $691.5 million budget for fiscal 2018 based on adopting the certified rate, which was not available at the time. By law, the commission is required to adopt the state-certified millage rate of 2.4976 mills to keep the county's revenue level. However, the commission is not bound to leave it at the lower rate. Resetting to the existing rate equates to a 26.76-cent increase of the certified tax rate. Compared with his original no-tax increase budget proposal, Coppinger's new spending plan would increase the annual property tax bill on a typical $150,000 home in Hamilton County by nearly $100. The boost in revenue comes from increased property values logged in the county's recent reappraisal, which is conducted every four years. Standing in front of a large group of supporters from the business, education, home building and law enforcement communities, Coppinger said the tax increase would allow the county to use its favorable AAA bond rating with today's historically low interest rates to borrow money at attractive terms for needed investments in the future. He said education and infrastructure improvements are required to continue to help sustain economic growth in Chattanooga, which grew jobs in the past year at twice the rate of the statewide average in Tennessee. Nonetheless, critics immediately questioned the need for the tax hike. "The people this is going to hurt the most are those on fixed incomes, especially the elderly who are struggling to stay in their homes," said Mark West, president of the Chattanooga Tea Party. "Too often, politicians' automatic default when there is a shortfall is to raise taxes rather than look for other ways to cut spending or change the way they are doing business like a family would when it doesn't have enough income." West said he and many others will oppose the proposed tax increase "and hopefully, the county commission will drop this idea like a hot potato." Coppinger said he felt confident he had enough commissioner votes to see the property tax proposal through, adding he has talked individually with each commissioner about the plan. "If you vote for this, you're recognizing the needs," he said. "If you don't vote for it, then [you are saying] you don't have needs in your community, right?" This stance is a turnaround from when he presented the 2018 budget. At the time, he said hardly any commissioners voiced an interest in raising the tax rate or doing anything other than settling for the state-certified tax rate. 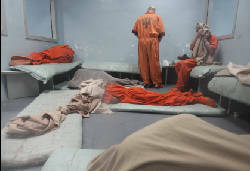 Since then, a number of opportunities outside the education component — including the construction of a sewage treatment plant in the growing northeastern part of the county and expansion of inmate housing at the Silverdale Correctional Facility — came to an early fruition after the normal budget process, Coppinger said. "It makes sense to be more aggressive to do it now while there's an opportunity to borrow money more cheaply," he said. "It makes sense to the taxpayer." Commissioner Joe Graham, who — along with Commission Chairman Chester Bankston and Commissioner Warren Mackey — joined Coppinger at the courthouse announcement, called it "the right thing to do," but he won't call it a tax increase because people will not have to pay more in taxes if their property values did not increase. "It is generating more revenue," Graham said. "It gives us the opportunity to do the things we need to do, but it's not a tax increase. You know I have to feel passionately about it because I'm about to start my re-election campaign, and this is not the right time to be doing this, as far as politically." In June, Graham pushed for discussions about possibly maintaining the existing tax rate, but most of his colleagues showed little interest. "We're in the midst of major growth and we need to go hard right now and that money is going to make possible the fulfillment of all of this potential," Mackey said. "Without that money, we can't get the workforce to support the industrial growth coming our way." Mackey urged fellow commissioners to have the "fortitude" when it comes to supporting the mayor's tax proposal. Bankston said he would have no comment until today's meeting, when the mayor formally presents the property tax plan. Vice Chairman Greg Beck said he would support the proposal. "It's a good move at a good time," Beck said. "It helps some of the things we have been howling about with the schools. We need money to do these things and there's no other way to do it." Commissioner Tim Boyd said he couldn't comment without seeing the proposal first, but was "willing to meet the mayor halfway," which means cutting spending to a number of organizations he targeted in a spending plan he presented in March. The Chattanooga Convention and Visitors Bureau, the Urban League and the Humane Educational Society were included in his list. Commissioners Randy Fairbanks, Jim Fields and Greg Martin could not be reached for comment. Commissioner Sabrena Smedley had lost her voice due to illness and was unable speak on the phone, her husband Mark said. County commissioners could soften the impact of the higher property taxes on low- and moderate-income seniors by adopting a senior property tax freeze, similar to what the city of Chattanooga did this summer when it also decided to keep the increases in its taxes from the reappraisal. The tax freeze allows those 65 and older who own their own home and have an annual household income of $38,720 or less to freeze their current property tax bill on their primary residences as long as they live and stay in their homes. The freeze would not apply to home additions or other houses owned by seniors, and the stormwater fees would be exempt from the freeze. Wealthier seniors also would not qualify for the tax freeze. If approved, the proposed 15-year, $180 million bond issue is expected to be issued early next year to provide about $100 million for school building improvements and another $20 million to $30 million to fix and expand the Silverdale Workhouse to help meet state jail standards. Another $55 million or so would be used to pay off short-term debt. The county also would issue $45 million in 30-year revenue bonds to pay for the new sewage treatment plant, most of which Coppinger said would be repaid by WWTA sewer customers. Hamilton County government currently has $220.6 million in long-term debt. The Hamilton County Commission will hold a public meeting to discuss the need to exceed the certified tax rate on Sept. 6 at 8:30 a.m. Contact Dave Flessner at dflessner@timesfreepress.com or Paul Leach at pleach@timesfreepress.com.